lojinx dansk nyheder - they might be giants why? Brooklyn’s very own perpetual-motion machine, They Might Be Giants are releasing their second album of 2015. The eagerly awaited follow up to their Grammy-winning "Here Come the 123s" and the Grammy-nominated "Here Comes Science", the legendary originals return to the world of kids stuff with a fantastic set of new songs. Why? will be released 27th November via Lojinx and features a collection of new songs on their 2015 Dial-A-Song re-launch. Coming out of the gate with the odd brilliance of “Oh You Did” through the pop charm of “Out of A Tree,” “Elephants” and “Omnicorn,” to the rocking optimism of “Then The Kids Took Over,” Why? has everything to delight both kids and parents alike. The album also celebrates marriage equality with the song “And Mom and Kid,” a track the band contributed to an HBO special on family diversity called "A Family is A Family is A Family.” Love wins! TMBG’s projects for kids always deliver memorable songs with irresistible melodies and original production values — all in a family-friendly package with none of that pandering aftertaste. They Might Be Giants are in the middle of an epic year. They are releasing a new song (and video) every week through their Dial-A-Song project and touring non-stop. They will be returning to the UK in January 2016. Pre-order Why? HERE and get 4 instant mp3 downloads! 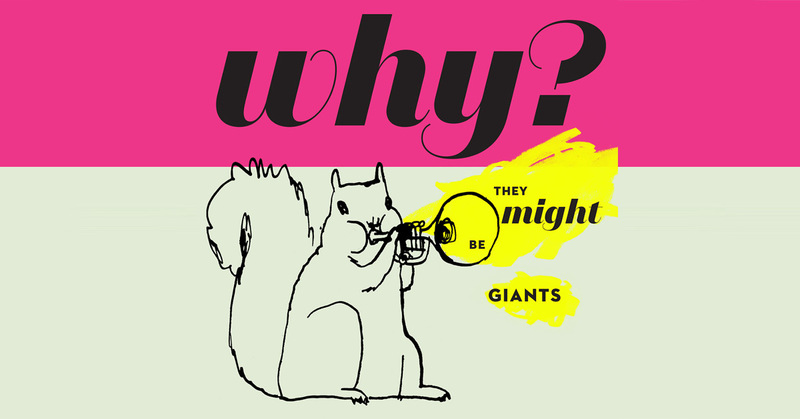 Share nyheder - they might be giants why?